There’s a Guinness World Record for numerous strange and far-out feats, including one for the heaviest rideable bicycle. Frank Dose from Schacht-Audorf in Germany just broke that record. Using largely recycled materials, he constructed a massive bike that weighs 1.08 metric tons, and then showed he could actually ride it. Dose decided to go for building the bike on a dare. He’d designed a bike made of scrap metal to ride at a festival, but a friend said the design probably wouldn’t work. Dose decided to prove his friend wrong. He gathered scrap steel and fertilizer spreader tires to create the giant bicycle. The tires weighing “hundreds of kilograms” add tremendous heft to the bike. Their diameter is a whopping 1.53 meters, or around five feet. The cost of the bike was weighty too: Dose estimates he spent $4,700. On September 3, Dose demonstrated he could indeed ride the bike. 5,000 people showed up to watch him ride more than 100 meters, or around 328 feet, the minimum distance Guinness World Records will accept to declare the bike rideable. Although the bike only moved at a lumbering five kilometers per hour, Dose says riding the bike is actually pretty easy. Olaf Kuchenbecker of the Rekord-Institut für Deutschland (Record-Institute for Germany) was also on hand to measure the bike. It will likely be a few months before Guinness World Records officially confirms Dose broke the record, but chances are good they will. Jeff Peeters of Belgium recently set the previous record announced in March, but his bike (albeit still massive) weighs just 860 kilograms, around 200 kilograms less than Dose’s heavy bicycle. 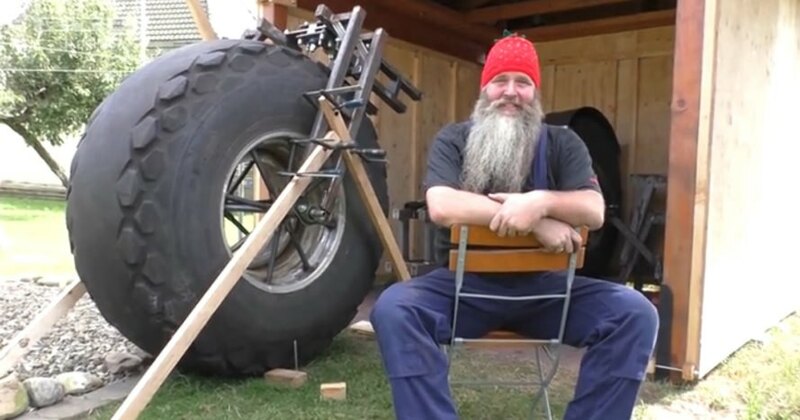 German man Frank Dose just built the heaviest bicycle in the world. He used scrap metal and fertilizer spreader tires to construct the massive bike.